Save the Date for our 2nd Annual Karaoke Fundraiser. Come out for great food, drinks and lots of singing from some of your favorite community members in town! All while raising funds for the Rotary Club which are in turned donated for projects in Burbank. Sponsorship forms are available to the left of this article! Or Click Here to Purchase Your TICKET OR SPONSORSHIP! 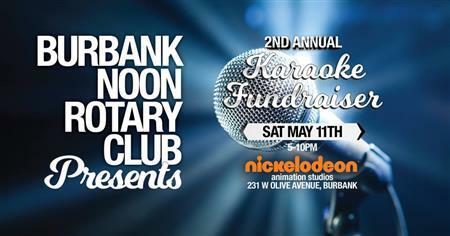 On Saturday, May 11th 2019 at 5:00PM - Burbank Noon Rotary will be hosting its 2nd Annual Rotary Karaoke bash at the amazing Nickelodeon Studios in Burbank, CA. This fun musical evening will be emceed will have our own Rotary community twist on Karaoke. As part of the event's fundraising objective (and to provide tons of entertainment for all of our attendees), for $25 any attendee can nominate any other attendee to sing a song of their choosing. That individual can then sing the nominators song choice at no cost to them, or for $40 they can select a different song, or for $50 they can opt not to sing at all. Each attendee can only be nominated one time so if you are going to nominate someone, make sure you choose a great song. A cash bar (soft drinks, wine, beer and liquor) and savory appetizers will be available throughout the evening. Click the "Interested" button to receive updates about the event and to be notified when tickets are available for purchase. The Burbank Rotary Foundation is a registered 501(c)(3) organization (95-3682678).